DURAND, JAMES, businessman, politician, office holder, and militia officer; b. 1775 in Abergavenny, Wales, son of a British officer; m. first 1797 a woman whose name is unknown, and they had two sons and two daughters; m. secondly c. 1807 Kezia (Keziah) Morrison, a widow, and they had four sons; d. 22 March 1833 in Hamilton, Upper Canada. 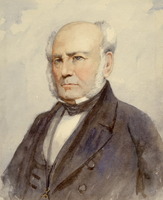 James Durand arrived in British North America in 1802 as agent for Caldcleugh, Boyd, and Reid, a London mercantile house, to settle delinquent accounts. After a brief stay in Montreal, he turned his attention to the indebted partnership operating the Bridgewater Works near Chippawa, Upper Canada. Powered by the current above the falls at Niagara, this establishment included a sawmill, grist-mill, iron forge, ten outbuildings, and a tenement for labourers. Durand seized the operation, drew bills of exchange on his London masters, and initiated a lawsuit at York (Toronto) to hold mill master Robert Randal to an indenture with the works. Having put matters in order for his employers during the summer of 1802, in July 1804 Durand purchased the Bridgewater Works and considerable property along Chippawa Creek, as well as land in Ancaster and Delaware townships. To finance his acquisitions, he agreed to pay his employers £11,000 by instalments commencing in 1806 and concluding in 1811. Randal managed Bridgewater while Durand opened a trading depot near Long Point and arranged grain shipments to Bridgewater. For assistance he employed Peter Desjardins as clerk. In a short time Durand had established himself as an ambitious merchant. He journeyed to England in 1804, returning to the store near Long Point with his wife and English hounds – Durand was a marksman, hunter, and dog fancier. In 1805 he moved to his newly purchased properties in lot 14, concession 3, Barton Township. From this site he continued until 1810 his extensive business with settlers in the Niagara and London districts. In 1809 he acquired a further acreage in lot 14 from Nathaniel Hughson and the following year the two men promoted their properties as the site for an administrative capital in the event a new district was established. About this time Durand’s enterprises suffered from a depression in the produce market which forced merchants to sacrifice assets in order to collect hard currency to meet the demands of their Montreal and British creditors. His situation was exacerbated by competition with the Bridgewater Works from new grist-mills which had begun to operate in Norfolk County. As a consequence, he sold the works to Thomas Clark and Samuel Street*, two of the leading financial magnates in the Niagara peninsula, in 1810. Durand maintained his store, some lands, and the Barton farm. The War of 1812, however, disrupted his remaining enterprises. Shipments were interrupted; the flow of American settlers, central to his lines of endeavour, stopped; settlers were unable to meet mortgage payments; and a few clients defected to the Americans leaving unsettled accounts. Durand’s experience of the war itself was a study in contrast. Major-General Isaac Brock* appears to have been entertained at his Barton farm while en route to Detroit in 1812. Durand, a loyal subject, served as captain of a flank company in the 5th Lincoln Militia and distinguished himself at the battle of Queenston Heights. In 1814 he had to billet British troops on his farm and, like his neighbours, suffered considerable property damage, his losses amounting to £172. Perhaps more important to him was the abuse of civil liberties associated with the military presence. Criticism of the conduct of the regular army by anyone in the midst of what had become a military camp at Burlington Heights (Hamilton) implied risks. Durand was warned by John Willson*, a Saltfleet farmer and assemblyman, that “times were too dangerous for a man to open his mouth.” None the less, Durand censured aspects of military conduct and when a local assemblyman, Abraham Markle, joined the Americans in 1813, Durand ran for his vacated seat, entering the assembly in February 1815. In the mean time he had sold his Barton lands to George Hamilton* for £1,750 and moved to a salt spring in the Trent River valley. The war had cut off the routine supply of salt –an essential preservative of meat – driving up the price. Durand, no doubt, had hopes of a successful enterprise. 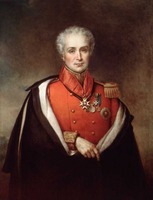 Until 1820 Durand was a reform leader in the province who impressed his peers with his command of parliamentary precedents, his intimate knowledge of the colony, and his sharp tongue. In 1815 he denounced the imposition of martial law during the war and criticized the methods adopted for requisitioning supplies. 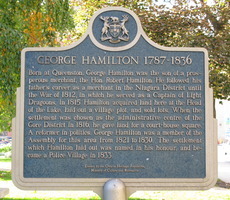 By 1816 Durand had moved back to the Head of the Lake (the vicinity of present-day Hamilton Harbour), settling on a farm near Dundas. In 1816 he was a member of the committee on finance and the committee to draft a militia code. His greatest accomplishment, however, came as chairman of the committee on education. Its report, condemning the failure of the government to provide for the instruction of poorer inhabitants, led to the Common Schools Act of 1816. This reform, which annoyed John Strachan*, was largely the work of Durand. 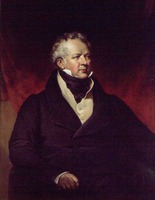 Efforts in support of economic development also made him an active local figure in 1816. He guided the bill establishing the Gore District through the house and acted as agent for Hamilton and Hughson to secure the designation of their plot as the site of the district town. The new district presented Durand with opportunities for office. In April 1816 he became the registrar for Wentworth and Halton counties, a position offering intimate knowledge about land and business transactions. In May he took the oath of road commissioner and, as a self-interested merchant and land speculator, pressed for improvements to the roads in the area between Ancaster village and the Grand River. 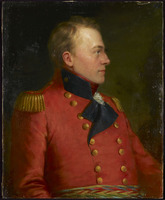 As foreman at a “Grand Inquest” held at Ancaster during January 1817, Durand criticized alleged disorder among the Indians which he considered a threat to the main road and to the general progress of contiguous settlements [see George Powlis*]. Durand was elected for the riding of Wentworth in February 1817. During the election he had attacked the conduct of wartime administrations and his opponent, John Willson. Durand took his seat on 25 February and on 1 March the assembly led by Robert Nichol branded his election broadside (printed by Bartemas Ferguson and published in the Niagara Spectator by Richard Cockrell) a “scandalous and malicious libel.” Three days later the assemblymen voted to jail him for the remainder of the session. Durand, however, absented himself and as a consequence on 7 March was held in contempt of the house and expelled. 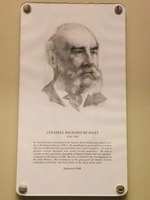 The previous day Nichol had introduced a petition from Richard Beasley* and other freeholders of Wentworth complaining that since Durand’s name did not appear on the county assessment rolls he was ineligible to represent the riding. A writ for a new election was issued on 24 March; Durand, having established proper qualifications, was re-elected. In November 1817 he chaired a meeting held in Ancaster to collect information for Robert Gourlay*. During the first parliamentary session of 1818, Durand recovered his position of leadership by defending the rights of the assembly against the pretensions of the Executive and the Legislative councils. As chairman of the public accounts committee, he investigated how annual grants from Great Britain had been spent; his conclusion was that they had not advanced the development of the colony but had lined the pockets of executive favourites. With regard to the Legislative Council, Durand led the house and council to a deadlock, claiming that, like the House of Commons, the House of Assembly could draft or revise money bills. 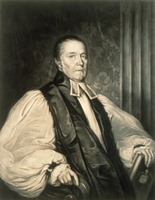 His actions forced Administrator Samuel Smith to prorogue the session. The arrival of Lieutenant Governor Sir Peregrine Maitland* silenced Durand’s reform activities. In part, Maitland’s administration responded to concerns about inadequate internal development. Durand, for instance, sat on a committee to consider improvements to St Lawrence navigation; he chaired another recommending a canal to link lakes Ontario and Erie. Maitland, however, suppressed Gourlay’s conventions, and Durand was sensitive to the denial of patronage and exclusion from land grants inflicted on Gourlay’s supporters. Durand made his peace, presenting a motion in the assembly that a letter published by Gourlay in 1819 be deemed libellous. Then, in the election of 1820, he was defeated by George Hamilton; ten years later, Allan Napier MacNab* turned back an election challenge by Durand. Durand’s business affairs grew after 1820. 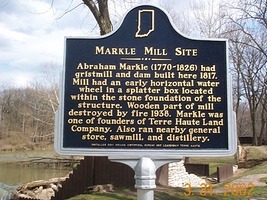 He erected two sawmills on Fairchild Creek and secured 1,200 acres with timber stands. He also purchased land in Brantford, London, and Sarnia Township. In the late 1820s, along with his son-in-law Peter Hunter Hamilton and Peter Desjardins, he participated in the Desjardins Canal Company. Sons James and Charles Morrison enjoyed local reputations as reform spokesmen during the 1830s. AO, RG 1, A-I-6: 4820–21. PAC, MG 24, B18, 14; RG 5, Al: 12784–85, 14336–39, 14957–64, 18473–74; RG 19, E5(a), 3732, claim 331. “Journals of Legislative Assembly of U. C.,” AO Report, 1912: 177, 207–8, 210–16, 264, 292, 337–45; 1913: 3, 50, 73, 90, 170, 438–39, 550–52. Charles Durand, Reminiscences of Charles Durand of Toronto, barrister (Toronto, 1897), 9, 17–21, 45, 105–9, 143, 414. E. J. Hathaway, Jesse Ketchum and his times: being a chronicle of the social life and public affairs of the province of Upper Canada during its first half century (Toronto, 1929), 101–11. Adam Shortt, “The economic effect of the War of 1812 on Upper Canada,” The defended border: Upper Canada and the War of 1812 . . . , ed. Morris Zaslow and W. B. Turner (Toronto, 1964), 299–300. E. A. Cruikshank, “A country merchant in Upper Canada, 1800–1812,” OH, 25 (1929): 160–62; “A study of disaffection in Upper Canada in 1812–15 ,” RSC Trans., 3rd ser., 6 (1912) , sect. ii: 11–65. H. F. Gardiner, “The Hamiltons of Queenston, Kingston and Hamilton,” OH, 8 (1909): 28–31. John C. Weaver, “DURAND, JAMES,” in Dictionary of Canadian Biography, vol. 6, University of Toronto/Université Laval, 2003–, accessed April 20, 2019, http://www.biographi.ca/en/bio/durand_james_6E.html.